Majid Rostami Sahrbabaki delivered a seminar on "The link transmission model – An overview" on 22 December 2016. Claudio Roncoli co-organised a Special Session on "Recent advances in motorway traffic control" at the 19th IEEE Intelligent Transportation Systems Conference (ITSC2016), November 1-4, 2016, Rio de Janeiro, Brazil. The 12th edition of the popular Short Course on Dynamic Traffic Flow Modelling and Control was held on 14-18 November 2016 in Chania, Greece, with the TRAMAN21 PI, Prof. Markos Papageorgiou, as the Course lecturer. The Short Course was attended by 33 participants; among them 8 TRAMAN21 researchers; 4 researchers from EPFL, Switzerland; 3 researchers from TU Delft, The Netherlands; 2 researchers from Technical University of Munich, Germany; 2 researchers from Imperial College, United Kingdom; 2 researchers from Linkoping University, Sweden; 2 employees of VicRoads, Australia; 1 employ of Aegean Motorway S.A., Greece; 1 employ of Stratec S.A., Belgium; and 1 researcher from University of Naples "Federico II", Italy; 1 researcher from Munich University of the Federal Armed Forces, Germany; 1 researcher from Universite du Luxembourg, Luxemburg; 1 researcher from KTH, Sweden; 1 researcher from New York University, U.A.E; 1 researcher from University of Queensland, Australia; 1 researcher from Saint Petersburg State University, Rusia; and 1 researcher from Shiraz university, Iran. The 1st Symposium on Management of Future motorway and urban Traffic Systems (MFTS 2016), which was organized and partly sponsored in the frame of the TRAMAN21 project, was successfully held in Chania, Greece, on June 2-3, 2016. The Symposium gathered 88 participants from 21 countries from around the globe. A number of 47 invited presentations, including two invited keynote presentations, were held by distinguished researchers in the area. The Symposium focused on future traffic management systems, covering the subjects of traffic control, estimation, and modelling of motorway and urban networks, with particular emphasis on the presence of advanced vehicle communication and automation technologies. The full Program and Book of Abstracts may be downloaded at this LINK. The Scientific Committee decided that this Symposium would be the first in a series of bi-annual symposia on this highly relevant topic, and the next 2nd Symposium on Management of Future motorway and urban Traffic Systems (MFTS 2018) will be held at the JRC (European Commission’s Joint Research Centre), Ispra, Italy. All members of TRAMAN21 participated to the Sysmposium and the following presentations were delivered: "Optimal lane-changing control at motorway bottlenecks" (Claudio Roncoli), "Applications of nonlinear adaptive control to local and coordinated ramp metering" (Maria Kontorinaki), "On macroscopic modelling of ACC/CACC traffic flows" (Anargiros Delis), "Using motion planning techniques as a means to improve traffic flow" (Ioannis Ntousakis), "Feedback-based integrated motorway traffic flow control" (Ioannis Papamichail). TRAMAN21 is sponsoring the 1st Symposium on Management of Future motorway and urban Traffic Systems, which will be organised in Chania (Greece) on June 2-3, 2016. The Symposium is focused on future traffic management systems, covering the subjects of traffic control, estimation, and modelling of motorway and urban networks, with particular emphasis on the presence of advanced vehicle communication and automation technologies. Further details can be found at this LINK. 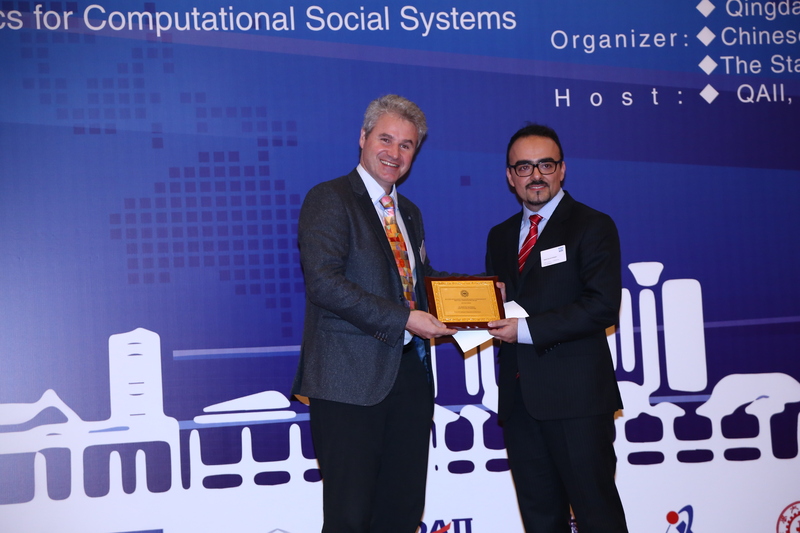 Claudio Roncoli co-organised a Special Session on "Management and control of motorway traffic systems" at the 14th IFAC Symposium on Control in Transportation Systems (CTS2016), May 18-20, 2016, Istanbul, Turkey. Weiming Zhao delivered a seminar on "Modelling the impact of VACS in urban roads: autonomous intersection management and trajectory planning" on 27 April 2016. Claudio Roncoli and Ioannis Papamichail organised a Special Session on "Advances in motorway traffic control" at the 18th IEEE Intelligent Transportation Systems Conference (ITSC2015), September 15-18, 2015, Las Palmas de Gran Canaria, Spain. Claudio Roncoli co-organised a Special Session on "Design, Modelling and Control of Autonomous and Cooperative Vehicle Systems" at the 18th meeting of the EURO Working Group on Transportation (EWGT2015), July 14-16, 2015, Delft, the Netherlands. The 11th edition of the popular Short Course on Dynamic Traffic Flow Modelling and Control was held on 3-7 November 2014 in Chania, Greece, with the TRAMAN21 PI, Prof. Markos Papageorgiou, as the Course lecturer. The Short Course was attended by 23 participants; among them 7 TRAMAN21 researchers; 5 researchers from KTH, Sweden; 4 researchers from TU Delft, The Netherlands; 3 researchers from EPFL, Switzerland; and 1 researcher from UPC, Spain; University of Dar es Salaam, Tanzania; AIT Austrian Institute of Technology, Austria; and University of Naples Federico II, Italy. Professor Todor Stoilov and Professor Krasimira Stoilova delivered a seminar on "Through multilevel optimization to self-optimization control" on 1 October 2014. Claudio Roncoli and Ioannis Papamichail organised a Special Session on "Optimal control of motorways" at the 20th Conference of the International Federation of Operational Research Societies (IFORS2014), July 13-18, 2014, Barcelona, Spain. Dr. Nikolaos Bekiaris-Liberis (University of California, Berkeley, USA) delivered a seminar on "Nonlinear control of delay and PDE systems: Methods and applications” on 12 June 2014. Jose Ramon Dominguez Frejo (University of Seville, Spain) delivered a seminar on "Macroscopic modelling and control of reversible lanes on freeways” on 12 November 2013. TRAMAN21 Workshop 2013 was organised in Chania (Greece) on 1st November 2013. For further details, visit the TRAMAN21 Workshop website. The presentations given at the Workshop could be downloaded from this link. Assist. Professor Vittorio Marzano (University of Napoli "Federico II", Italy) delivered a seminar on "Quasi-dynamic estimation of o-d flow from traffic counts: Research outcomes and perspectives" on 13 September 2013. TRAMAN21 hosted the Workshop on Modelling Uncertainties of the COST Action MULTITUDE in Chania, Greece, on 30 May 2013. Most TRAMAN21 researchers participated at the Workshop. Prof. Markos Papageorgiou delivered an invited keynote presentation on "Traffic flow modelling: Some critical questions". See here for the Workshop program. Prof. Markos Papageorgiou and the TRAMAN21 Team received the 2018 IEEE Intelligent Transportation Systems Society Outstanding ITS Application Award for "Contributions in Vehicle Automation and Communication Systems and Applications". The award was presented to Prof. Ioannis Papamichail during the 21st IEEE International Conference on Intelligent Transportation Systems, Maui, Hawaii, USA, November 4-7, 2018. Dr. Maria Kontorinaki, a former PhD student within TRAMAN21, received the 2nd Prize for the 2018 IEEE Intelligent Transportation Systems Society Best PhD Dissertation Award. Maria Kontorinaki, a former PhD student within TRAMAN21, was elected Lecturer in Operations Research in the Department of Statistics and Operations Research within the Faculty of Science at the University of Malta. Maria has been a member of the Dynamic Systems and Simulation Laboratory from 2012 to September 2017. Since October 2017 she has been a post-doctoral researcher at KIOS Research and Innovation Center of Excellence, Nicosia, Cyprus. We are certain that she will continue a brilliant academic career. Best wishes, Maria! Maria Kontorinaki, a PhD student within TRAMAN21, received a post-doctoral researcher position at KIOS Research and Innovation Center of Excellence, Nicosia, Cyprus. Dr. Konstantinos Makantasis, postdoctoral researcher within TRAMAN21, received a post-doctoral researcher position at KIOS Research and Innovation Center of Excellence, Nicosia, Cyprus. Dr. Nikolaos Bekiaris-Liberis was awarded a competitive (about 1/7 of the submitted proposals are successful every year) 2016 Marie Curie-Sklodowska individual fellowship grant by the European Commission to develop PDE-based control designs for traffic flow. Dr. Claudio Roncoli, postdoctoral researcher within TRAMAN21, was elected Assistant Professor at Aalto University (Finland). Claudio has been a pillar for the project with valuable contributions over the last 3.5 years. Given his extraordinary qualities, we are certain that he will have a brilliant academic career. Best wishes, Claudio! The 1st Symposium on Management of Future motorway and urban Traffic Systems (MFTS 2016) was successfully held in Chania, Greece, on June 2-3, 2016. The Symposium gathered 88 participants from 21 countries from around the globe. A number of 47 invited presentations were held by distinguished researchers in the area. The full Program and Book of Abstracts may be downloaded at this LINK. The Scientific Committee decided that this Symposium would be the first in a series of bi-annual symposia on this highly relevant topic, and the 2nd Symposium on Management of Future motorway and urban Traffic Systems (MFTS 2018) will be held at the JRC (European Commission’s Joint Research Centre), Ispra, Italy. We are happy to report that our application to extend the TRAMAN21 duration by one year has been approved by ERC. The TRAMAN21 team is continuing enthusiastically its productive and groundbreaking work, now through February 2018. We are thankful to ERC for this decision. Interested colleagues who missed (or could not enter due to exceeded system capacity) Prof. Papageorgiou's webinar on "Traffic Management in the ERA of VACS" may find the presentation slides or watch offline the recorded video on the VRA-Project Website here. Ms. Dimitra Dimitriadi, an undergraduate member of DSSL and contributor to TRAMAN21, finalised successfully her Diploma thesis in August 2015. The Diploma thesis is entitled "Application of Optimal Control methods for the fuel consumption minimization of vehicles on motorways". Prof. Markos Papageorgiou will deliver a webinar, organized by the European VRA (Vehicle and Road Automation) project, on "Traffic management in the era of vehicle automation and communication systems (VACS)" on September 4, 2015, at 15:30 - 16:30 (CET). For more information and registration to the Webinar click here. Anastasia Spiliopoulou, a member of DSSL and contributor to TRAMAN21, accomplished successfully her PhD thesis defense on 15 June 2015. The jury comprised 3 external members (Prof. Alex Skabardonis - University of California Berkeley, Prof. Nikolas Geroliminis - École Polytechnique Fédérale de Lausanne, Dr. Konstantinos Ampountolas - University of Glasgow), as well as the TRAMAN21 researchers Profs. M. Papageorgiou, I. Nikolos, A. Delis and I. Papamichail. The PhD thesis is available here. On the occasion of the TRAMAN21 mid-term review, we accounted for the visits of this website of the project. Up to now, the website was visited about 84.500 times by 9.175 different visitors (characterised by different IPs). Some 44% of visitors were from European countries, 30% from Asian countries, 25% from North American countries, and the remaining 1% from the rest of the World. We thank our visitors for the interest in this project and we will do our best to continue to deliver interesting information and results to the relevant technical and research community. The first TRAMAN21 report has been released. It provides a review and analysis of VACS, focusing particularly on systems which are relevant for future motorway traffic management concepts. Enter Reports to read and/or download the complete report. TRAMAN21 is looking for interested motorway Road Authorities to cooperate in the preparation and execution of an innovative field trial. See here for details. Watch the invited honorary webinar “Freeway Traffic Control: Past, Present and Future” by Prof. Markos Papageorgiou, organised by the Committee on Traffic Flow Theory and Characteristics of the TRB (Transportation Research Board). On behalf of TRAMAN21, the Technical University of Crete has entered the consortium of the European 7FP VRA - Support Action for International Vehicle and Road Automation Network. Enter WP1 Progress to access current results from VACS literature review and classification, and stay tuned for updates and forthcoming analyses of the most promising, with respect to road efficiency, motorway operations-related systems.